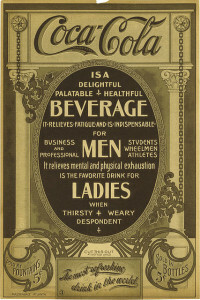 Coca-Cola began issuing serving trays and tip trays in 1897 and most collectors consider the period from 1897-1968 as the “original” era of Coca-Cola trays. After 1968 Coca-Cola began producing trays from new materials in many different sizes and produced many authorized replicas of original older trays. Almost any time you see an old design now from the early years, it’s a reproduction and it’s difficult for new collectors to tell the difference. In addition, Coca-Cola trays have been produced for many different markets and there are so many different designs out there that it can be hard to tell whether you’re looking at an authentically Coca-Cola produced tray, or a fantasy tray made up by a scam-artist. We have tried to get images and information on as many original trays as possible on this site, but we certainly don’t have them all. Just because your tray isn’t listed on our site doesn’t mean it’s not authentic or valuable so feel free to Contact Us for more information. In general Coca-Cola trays from the earliest years 1897-1900s can be worth thousands and thousands of dollars and condition is very important. Even trays with rare designs that date through to the 30s and are in good condition can be worth a lot. Trays with more common designs from the 1910’s-1950’s can still be worth hundreds and after that period the value tends to fall off as the trays are still pretty common. Designs and trays that are more common will have a larger emphasis on condition and any defects can drastically reduce the value.